THOR geeks, gird your loins! The hammered hero, Thor (Chris Hemsworth) and his pissed off brother, Loki (Tom Hiddleston), are back for more underworld action, but this time they've got even more to contend with than each other. This Malekith fella is played by Christopher Eccleston, who I vaguely remember from The Others and 28 Days Later...(it's clear he's got a penchant for the darker fare). It seems that all the actors from the previous movie have reprised their roles in the new film. Even Natalie Portman, who I wasn't much a fan of in the first movie, but that was also on account of the fact that her character as a whole was a bit silly to me (and needlessly meddling). Speaking of the Oscar winner, in the trailer it looks like the villains are using her character, Jane (Thor's abandoned love interest from the first film), as bait for Thor. Which means he's gonna be that much more salty about the whole Dark Elves situation. With that in mind, we may see a softer side of Thor that we didn't see as much in the first film. The clip shows the impending battle (which is gloriously shot, by the way), and also spotlights the ongoing rift between Thor and Loki (who's sporting extra angry hair these days). We also catch a glimpse of a few new characters in the franchise. While I was looking forward to seeing what director Patty Jenkins (Monster) would do with the movie (she was previously signed on to helm the project), judging by the trailer it looks like Alan Taylor (who's had a pretty impressive TV career) really did his thing. Screenwriters Christopher Yost, Christopher Markus and Stephen McFeely, none of whom are unfamiliar to the world of animation and comics, penned the script. I know we should be rooting for Thor, but Loki is just so thrilling to watch. 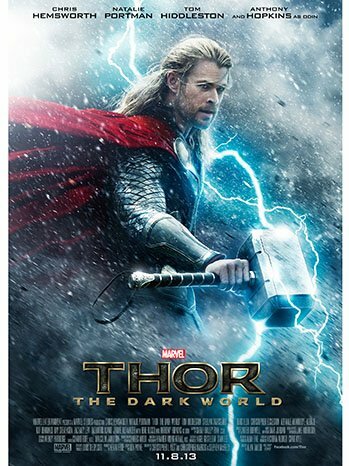 THOR: THE DARK WORLD heads to theaters November 8th. Alan Taylor really looks like he transitioned over to film very easily, looking foward to this quite a bit! I'm really looking forward to this, and I never thought I'd say that after viewing Thor for the first time. I thought it was so boring, then The Avengers came out, and I went back and re-watched and felt more invested that time around. Mostly for Loki, I hate to say he's my favorite character in the Thor world. I'm not the biggest comic book film fan but Thor was definitely one of the highlights. I'm looking forward to this. Wow! Great trailer! Now looking forward to this sequel!